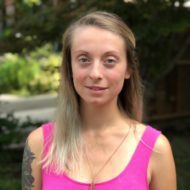 Mira Kevic is a CAPPA certified birth doula, who specializes in lactation education and is trained to assist hypnobirthing families. Her focus is on bringing calm and confidence to birthing and new parents. She spends much of her time educating parents on environmental parenting techniques, and has helped many people achieve their waste reduction goals. She is a mother of 2 and when she’s not working, you can find her at the park learning about life from her 2 biggest inspirations.